Alberta Health Services provides healthcare to millions of Albertans each year. We are part of an organization that employs over 110,000 people and in fact, is one of Canada's largest employers. This video is about The Rhythm Project, founded by two Mental Health professionals seeking to bridge the gap between the traditional medical model and a science and evidence-based therapeutic program. 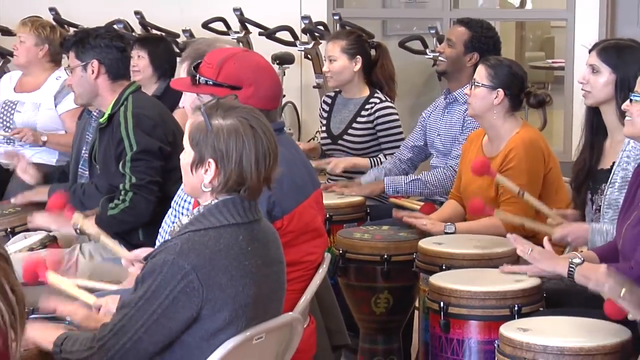 Informed by Dr. Bruce Perry's and REMO's HealthRhythms research articles on rhythm and its physiological benefits, Julien Lepage and Allen Rees were able to develop a therapeutic drum circle program for the health region in Calgary, Alberta. At its most crucial point of growth, the program was put on hold due to funding issues. Circles Of Rhythm and REMO stepped in with a tremendous amount of support and the program is now here to stay! Offering weekly drumming opportunities to thousands of patients, families, health providers, volunteers, and members of the community, the Rhythm Project is growing exponentially with a vision to expand across the province! Why Drums and Drum Circles? Karl Bruhn was considered by many to be the father of the music and wellness movement. In this article he talks about the attraction to drums. "They are like a magnet and few can pass a drum without touching it. But, more than that, people with little or no musical background can participate in group percussion activities."